What should young people do with their lives today? Many things, obviously. But the most daring thing is to create stable communities in which the terrible disease of loneliness can be cured. Hey, you: Pick up a paper! It never hurts to stray away from the blue glare of your smartphone and flip through a paper. I can definitely attest to this. 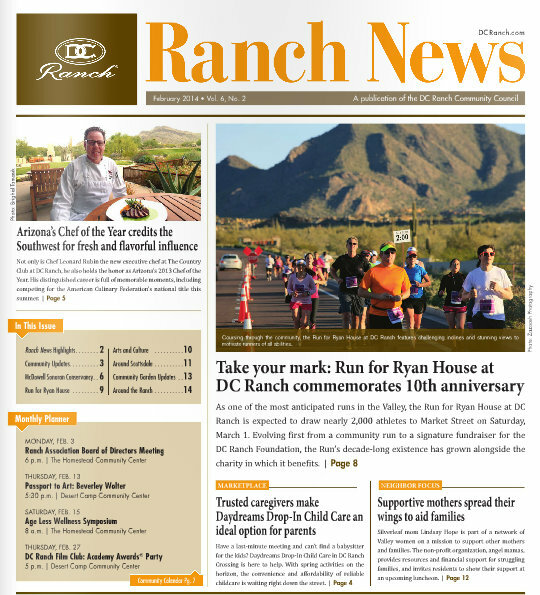 From managing “The Moon Valley Tattler” to DC Ranch’s “Ranch News,” community newspapers weirdly became my niche. I now have a monthly column called “Rookie Mom” that explores my neuroses and completely blind journey as a first-time mother in the Moon Valley community in North Phoenix. I sincerely being a voice in my community that’s being revamped by folks of my generation. I know that if I were lounging around a coffee shop to pick up a local paper, I’d be happy to read a relatable voice with an uncensored voice. And that’s my vibe. + September 2018: Are We Raising Role Models? + December 2018: I Need Your Advice! "A summer of acting, writing, and puppetry... oh my!" "Snow White parody is the 'cat's meow'"
"Award-winning residents talk screenwriting and British flick"
"Volunteer at Eggstravaganza and receive two complimentary passes"
"Independence rediscovered at 19,336 feet"
"Philanthrophy nominee calls for annual awards"
"Fresh produce from farmer's market jump-starts residents fight against breast cancer"
"The Country Club at DC Ranch's executive chef competes for culinary national title"
"Hope soars to mothers in need"
"A delicious array of food and forums in store for adults"
"DC Ranch Film Club explores Scorcese's directional legacy"
"Residents step up to breast cancer with an exclusive fundraiser"
"Local merchants offer delightful gift selections"
"Exceptional talent and passion makes 'Annie, Jr.' a smash"
"New season builds on success of DC Ranch Women's first year of gatherings"
"Longtime volunteer shows appreciation for Preserve by riding in the Tour"
"Former Playhouse actor gets a 'scream' from starring in Hollywood horror flick"
"Building history is a 16-year 'custom' in DC Ranch"
"Interactive fall activities create neighborly opportunities"
"The Homestead Playhouse announces fall production"
"Innovative practices embraced at Copper Ridge School"
"Engaging after-school programs promote active learning"
"Nine residents honored for enriching community through service"
"Recycled instruments make a bang at MIM"
"'DC Ranch Sunset' tantalizes the tastebuds for a cool refresher"
"Summer camp involvement ignites plenty of fun around the Ranch"
"Community garden calls on volunteers this summer"
"12-year-olds gain community support with unique swimming skills"
"Earth Day inspires office friendly ideas for a greener workspace"
"The age-old question: Bottled water vs. tap water"
"Community Council seeking nominations for volunteer awards"
"Upper East Side Big Band jazzes up Market Street for first Starlight Concert of spring"
"Uncommon 'ledger art' now featured at Heard Museum North Scottsdale"
"Keep a look out for prickly blooms in March"
"Chef shares Sardinian heritage by focusing on food and community"